Behind that wide, panting grin, two-year-old miniature schnauzer Chip is hiding a secret. He's been neutered, but most people will never be able to tell. Chip is the proud owner of Neuticles, or testicular implants for dogs. The silicone implants are slipped in during the time of neutering and replace the testicles that the veterinarians are removing. The company that manufactures Neuticles claims that more than 500,000 pets have had them implanted since they were put on the market in 1995. Neuticles are only one of the pet "plastic surgeries" that cats and dogs are undergoing. Dr. Jules Benson, chief veterinary medical officer at Petplan insurance, told CBS News that about 0.6 percent of their claims fall under what humans would consider plastic surgery procedures, so it's still relatively rare. Still, according to Petplan claims data, U.S. dog owners spent $62 million in 2011 on plastic surgery treatments. Unlike Neuticals, however, which are considered purely cosmetic, the most common plastic surgery procedures on pets are often medically necessary. Benson explained that because they have important health benefits, veterinarians like him prefer to call them "corrective surgery" procedures instead. One of the most frequent procedures, according to Petplan, is called entropion surgery, to essentially lift a dog's eyelids. Dogs like Shar-Peis have many wrinkles that collect bacteria between the skin folds, making the pooches prime candidates for infections. Fur can also into their eyes, and dogs may need what is called entropion surgery to stop the eyelids from rolling inward and scratching the cornea. "If you had folds moved around in your skin we would call that plastic surgery. In the case of the dogs, it's a medical necessity," Dr. Ann E. Hohenhaus, a staff veterinarian at the Animal Medical Center in New York, told CBS News. Another common procedure is surgery to correct brachycephalic syndrome, which occurs when the roof of the mouth is too long for the length of the animal's muzzle, blocking the trachea. This normally occurs in breeds with short noses, like pugs, since they have less space for the physical structures necessary for proper respiration. "Everything is kind of squashed and smaller than normal," Hohenhaus explained. To help alleviate those problems, doctors give dogs a "nose job" by cutting a small wedge out of the black part of their nose and pulling the nasal openings wider. 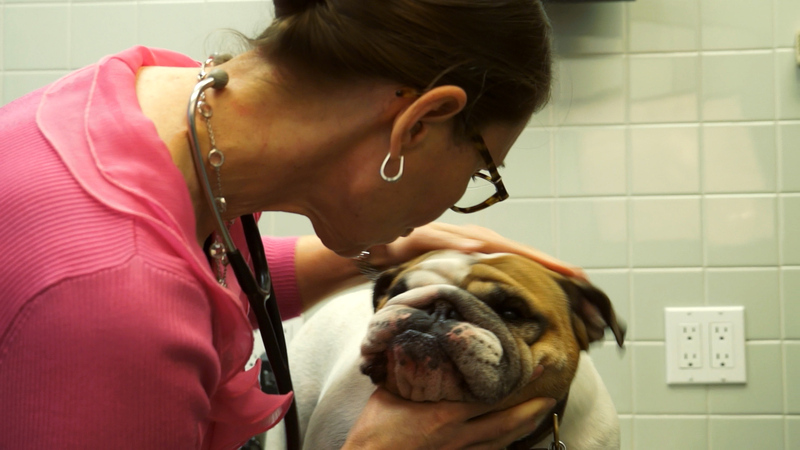 One of Animal Medical Center's patients, a 6-year-old English bulldog named Beatrice, has had the procedure done to help with her breathing. Though most people would assume that pet owners would only shell out the $4,000 to $5,000 needed for these surgeries for champion show dogs, Benson said the majority of the claims are for average household pets. Purebred show dogs who have such medical problems are often not bred because these qualities don't tend to win prizes. A lot of times owners don't do the proper research for the breed they are seeking to get -- and then are shocked when the medical bills pile up. For example, Benson points out that French bulldogs may be popular, but they aren't meant to withstand hot, Southern temperatures. It doesn't help that they're natural "couch potatoes," making them prone to obesity problems as well as breathing difficulties, made worse by their short noses. "You tell people, they have no idea, because they haven't done the time to do research on the breed," he explained. If you're hoping to avoid high veterinary bills, he suggests looking no further than your good old mixed-breed. "My ideal breed has always been a mutt," he said. "A medium sized dog with no weight problems or size problems." But if you've fallen in love with a dog that's prone to these health issues, both veterinarians said you shouldn't feel ashamed at getting them a bit of surgical help. It's clear Beatrice is breathing better and has a better quality of life since undergoing surgery. By comparison, the Neuticles that Chip received have no medical benefit. Dr. Andrea Y. Tu, an associate veterinarian at Park East Animal Hospital in New York where Chip had his surgery, says the implants are more for the owners. "Does the dog ever say, 'I'm empty and I'm not as much of a dog'? No." Still, Chip's owner, Manfred Stapff, is sure that the testicular implants were worth it. He doesn't regret having the procedure done, even if other people question him. "They find it somehow a mixture of strange and funny. It's New York City: people are strange and funny," he said.